The session on Friday remained much on the analyzed lines as the Equity Markets did witness buoyancy on back of exit polls outcome that reflected the ruling party BJP retaining power in Gujarat but also in the breath, the NIFTY continued to resist to the 10330-10360 zones as well. The benchmark Index spent the entire session moving in a capped range and resisting to this area. It ended with net gains of 81.15 points or 0.79%. Monday will start a likely volatile week for the Markets. We are all likely to see a initially positive opening but as we go ahead in the session, the Markets would also react in a somewhat volatile way to the Gujarat Election results that will start pouring in as well. Any unexpected outcome may dent this move, but if nothing untoward happens on Monday, we expect the Markets to continue with the heavy short covering that it witnessed on Friday and inch higher. The levels of 10390 and 10435 will act as immediate resistance levels for the Markets with the levels of 10160 and 10190 playing out as supports. The Relative Strength Index – RSI on the Daily Chart is 55.8677 is neutral against the price without showing any divergence. The Daily MACD has shown a positive crossover. 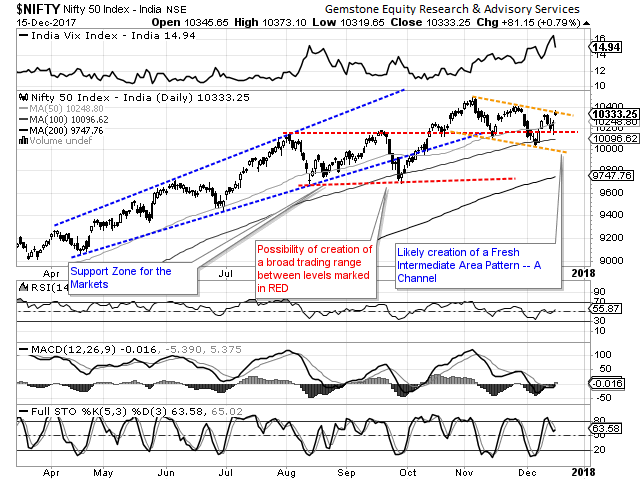 It is now bullish while trading above its signal line. On the Candles, a Rising Window has occurred. It has emerged after a long lower shadow and usually signals the continuation of the up move. The pattern analysis show the Markets resisting for the entire day to the upper falling trend line of the falling channel that is created. This is the short term intermediate trend that the Markets are trading in. 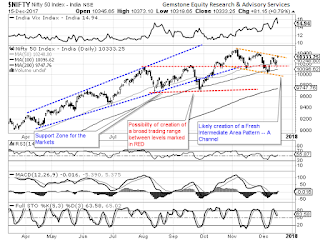 The RSI too has resisted to the falling trend line as it is subject to independent analysis. A breakout form this formation will precede any significant up move in prices. All and all, heavy short covering witnessed on Friday and we expect this to continue at least in the initial trade on Monday. The session is likely to remain volatile as the Markets reacts to the Gujarat Election results. It would be important to see that to sustain, the Markets will have to trade effectively above 10360-mark and the short covering needs to be replaced with fresh buying. Positive caution is advised for the d ay.